Since August 2006, the Bryansk branch of the Metallotorg company began its history. Service Metal Center is located in the village of Big Polpino at lane. 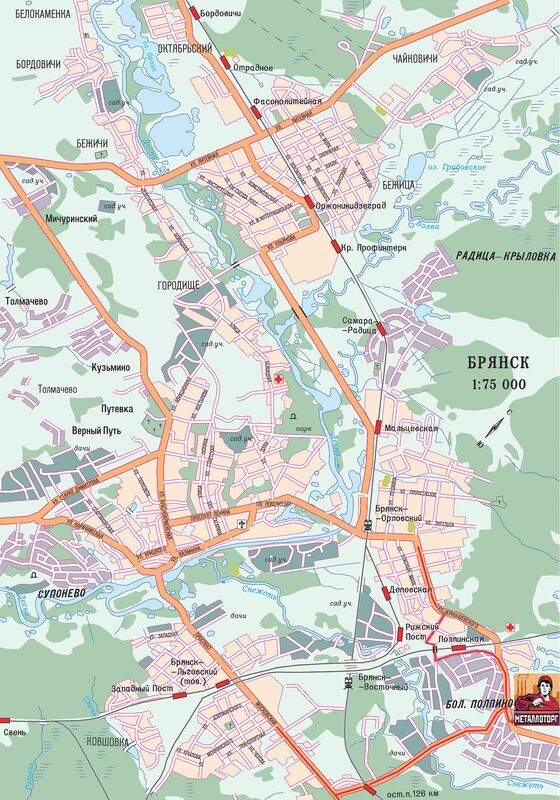 Oktyabrsky, 2 and has a railway connection, as well as good access roads both from the central districts of Bryansk and from the Moscovskoye highway, i.e. entry into the city. We managed to create a metal warehouse on a practically deserted industrial area that was well-groomed and convenient for the shipment of customers, which meets all the principles of civilized warehouse trade. Metal warehouse has an open area, 2 gantry cranes, a platform for straightening coiled rebars into a bar, a railway line for receiving wagons. All this allows you to quickly carry out work on the loading and unloading of metal. Металлопрокат на Metal products at the Bryansk branch warehouse are stored in specially prepared racks. Cellular accounting of metal allows you to avoid problems with the transfer of goods, and also provides fast shipping of metal to customers. We constantly supply and store a square pipe, rectangular pipe, 6.5 mm rod, 8 mm 10 mm in coils and rods. It also unwinds rebar from coils into bars. Metal is sold not only for enterprises, but also for country builders, not only corrugated rebars are shipped, but also smooth, as well as a strip from 20mm, 25mm to 40mm and wider, square bars 10, 12, 14.16, 20, 50x50 welded mesh , 100x100, welded beam from 70 to 100 B, K and Sh..
For the convenience of shipment of customers in the evening, the warehouse has sufficient lighting and is equipped with security systems and video surveillance. Also in the warehouse the following services are organized: order picking and processing of the rolled stock and pipes by a certain date, delivery of cars and railway. transport. Metal products can be ordered from our nearest branches in Chekhov, Lobnya, Orel, Kaluga, Kursk and Belgorod; but at Metallotorg's metal warehouse in Bryansk there is a wide range of metal: these are round bars St3, steel grade 45, steel grade 40Х, St20 and round bar St35, these are rebars St35GS and A500 C, hot-rolled steel sheets St3 and cold-rolled steel sheets St08ps, galvanized steel sheet, corrugated sheet, round pipe dia. 15, 25, 32, 40, 50mm, rolled profile 25,20,30,40x25, 50x25,50x50, and up to 120x100mm, wire mesh. The metal warehouse in Bryansk is selling metal such as steel sheet 20, 45 and 09G2S for mechanical engineering, beam st3 and st09G2S for builders (for example, beam 20Б1, 25Б1, 35Б1, 30Б1, 40Б1, also beam 25 к1, 30к1, 35 k1, 25sh1, 30sh1,40sh1,36m and 45m). The consumer can buy from us pipes, and metal-roll structural and carbon steel grades, angle bar channel 8, 10, 12, 14U, 16P, 20, 18, 24, 27, 30 and 40, there is a hexagonal bar available in stock. We provide rolled metal all nearby settlements edge - Fokin, Gmina Lubochnia, Dyatkovo, Bytosh, Zhukovka, Dubrovka, Rognedino, Kletnoe, Mglin, Surazh, Pochep, Unecha, Surazh, Klintsy, Zlynka, Novozybkov, Starodub, Red Mountain, Pohar, Trubchevsk, Altukhovo, Navlya, Sevsk, Belye Berega, Karachev. We have the opportunity to deliver metal by motor transport to the Smolensk region, Orel region, Kaluga region; usually we carry in those directions periodic and smooth rebar A400C, A500C, heat-hardened rebar AT-800; area 25, 32, 50, 63, 75; hot-rolled steel sheets from 2 mm and up to 100 mm. With the help of us, you can form combined wagons in the Belgorod region and the Voronezh region, where you can hardly find such a wide range of rolled metal and pipes like ours. We will bring metal and pipes, rebars and channels to Smolensk, Roslavl, Yartsevo, Safonovo, Vyazma, Kaluga, Aleksin, Tula, Plavsk, Mtsensk, Orel, Livny, Kursk, Belgorod. The history of our Bryansk branch is inseparable from the history of Bryansk itself, and we hope to make a significant contribution to the development of the Bryansk region. The history of statehood in the Bryansk region dates back to the end of the 10th century, when Prince Vladimir of Kiev, in order to subjugate the tribes of Vyatichi, "began to build cities along the Desna and Vostry, along Trubezhevi and along Sula, and along Stugne." In 985 the city was founded - the fortress of Bryansk, which also played the role of the center of the spread of Christianity (the original Vyatichi religion is the cult of Perun, the god of lightning). For many decades local elders stubbornly resisted the power of the Kiev princes and the introduction of Christianity. One of them, according to historians, was the half-legendary Nightingale - the robber who operated in the Bryansk forests. The original site of the city of Bryansk for a long time remained unknown. Only at the end of our century, archaeologists noticed the old name of one of the villages that are now part of Bryansk - the Settlement. Not far from it, on the mound, commonly referred to as the Chashin people, were found the remains of the very first urban settlement. At the end of the Xl century, the territory on which Bryansk is located departs to the Chernigov principality, and in 1147 it is conquered by Prince Svyatoslav Olgovich, who was expelled from Kiev. After that, Bryansk was not mentioned for a century in the annals. The Tatar-Mongol invasion did not affect Bryansk. The hordes of enemies did not dare to go deep into the thicket of the Bryansk forest. After the Tatars defeated Chernigov and the death of Chernigov Prince Michael, his son Prince Roman moved to Bryansk and founded the princely throne in it. Prince Roman Bryansky was a brave warrior, a cunning politician and diplomat. He managed not only to protect his lands from the Tatar and Lithuanian invasions, but also to expand their borders. The prince exercised supreme power in the region, in essence, being the head of state. He was primarily in charge of defense, foreign policy and public security, and also helped strengthen the church. After the Chernihiv bishop moved to Bryansk, the Bryansk principality became the religious center of southwestern Russia. In 1288 Prince Roman founded the Svensky Monastery in Bryansk. The strengthening of the Bryansk principality disturbed the Golden Horde, and in the 90s of the Xlll century, Prince Roman was deceived by fraud. The heirs of the prince mired in civil strife, and at the beginning of the XlV century Bryansk was ruined by the Tatars, and then fell under the authority of the Grand Duchy of Lithuania. Only in 1500, Bryansk was returned to Russia, and its residents swore allegiance to Moscow. It is easy to find us in the navigator by making the request "Metallotorg Bryansk"